Athletic.Authentic.Wild: Washington, Part 2: Tormented, Forbidden. Washington, Part 2: Tormented, Forbidden. As alluded to, Alex arrived in Washington fit and psyched to take advantage of the excellent weather. However, I was feeling under the weather, battling some normally-inconsequential health concerns, with that concern heightened by the consequences of getting further hurt or "going in the hole" immediately prior to the upcoming big exam. Generally, I take pride in tackling big endeavors regardless of what I have coming up. However, I am learning to rest better, and probably performing better as a result. One of those inevitable tensions I guess. Anyway, there we were. 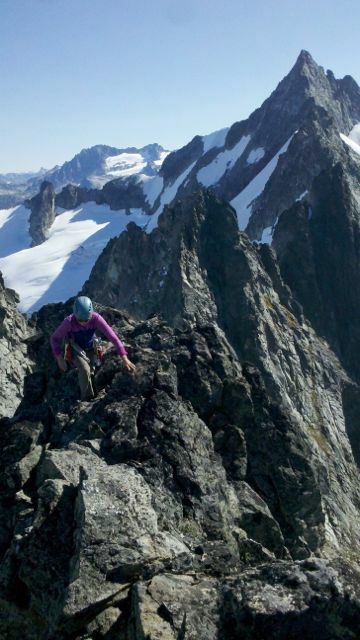 We warmed up with an underwhelming climb of the Beckey Route on Liberty Bell Spire. Alex had long lusted after this route and summit, but the experience was nothing to write home about. We took no pictures even. We shifted gears, after some debate, to the Boston Basin area. 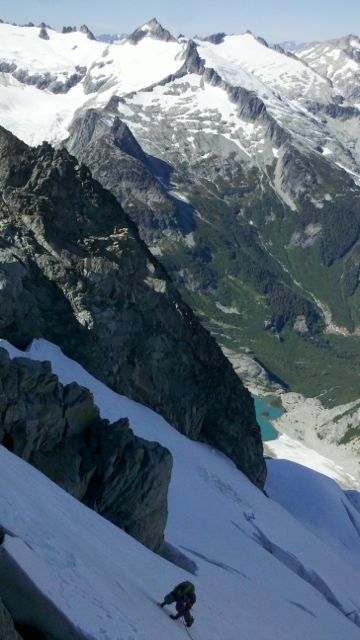 We'd give the Torment-Forbidden Traverse a try. Again, few pictures, as the day was characterized more by movement than by documentation. 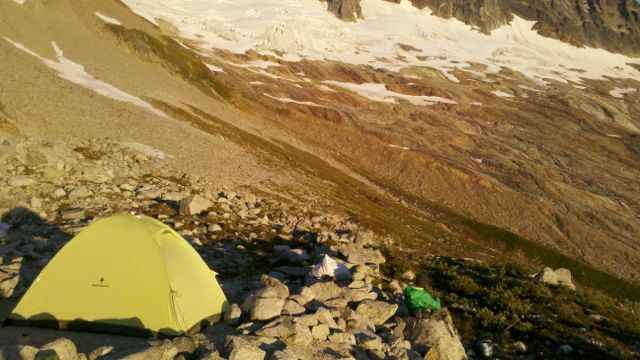 Base camp in Boston Basin. 2 nights here. Alex ridge-running on Mt. Torment. Refreshing in the North Cascades, peaks are named by a different convention. Less old, dead guys memorialized, more descriptive and relevant. I like it. Alex front-pointing steep neve in aluminum crampons and approach shoes. Someone more clever would come up with an apt automotive analogy. Like taking your Ferrari on the Rubicon? Or more like trying to take your Jetta up the White Mountain road? In any case, Alex went under-shod yet over-performed! In the end, facing the final few hundred feet to Forbidden's summit, we chose to take the short-cut out. We had daylight and conditions in our favor. Alex is never short on stokage. But, the main mission here being exam prep, I voted for an exit. Rather than flail another few hours into the deprivation zone, a long night in the tent followed by a chill exit sounded like the reasonable thing to do. Alex obliged.